Watson for Drug Discovery assists in developing testable hypotheses derived from literature. 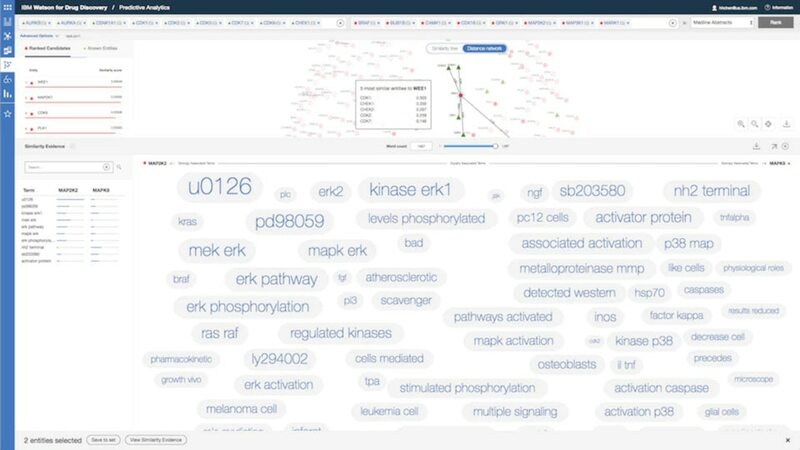 Watson helps researchers unlock connections between genes, drugs, and diseases that help them make the next discovery faster. See the power of Watson for Drug Discovery in our executive webinar. The reasoning analysis application is used to discover new entities related to a concept or entities of interest. Researchers at the University Health Network analyze millions of articles to identify potential drug repurposing candidates. Dr. Lacost discusses how innovation in the life sciences suffers from knowledge waste and lack of knowledge integration. Watson can accelerate identification of novel drug candidates and novel drug targets by harnessing the potential of big data.